UPDATE: It's official! The leaked press release mentioned below was the real deal so all information posted is accurate. For all intents and purposes, and despite Porsche's best efforts, it looks like the details of the new 2018 Porsche 911 GT3 were leaked ahead of the press conference scheduled a few hours from now in Geneva. According to a pictureless press release found on Rennlist (which appears to have originated from Porsche's official press site and has subsequently been taken down) the much anticipated 3rd model to debut in Genenva will be the 2018 991.2 GT3. 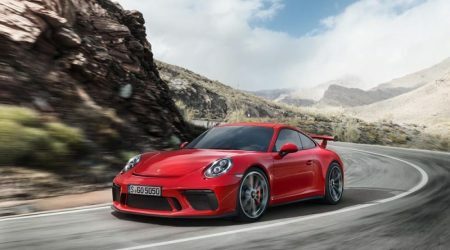 As had been reported before by Autocar, and hoped for by many, Porsche listened to the disenfranchised masses (otherwise known as "purists") and will offer the new GT3 with a 6-speed manual transmission as an option (PDK is still the standard transmission). Assuming the numbers in the leaked release are correct, it's going to be a tough choice for those that want to row their own gears. The PDK equipped version is said to reach 60 mph in just 3.2 seconds with a top track speed of 197 mph, while the three pedal version will hit 198 mph but take 3.8 seconds to find 60 mph. I'm not sure that .6 seconds makes up for seat-of-the-pants fun you get from shifting on your own, but sales numbers will tell the true story. Both versions are powered by a flat-six 4.0 liter engine based on those found in the 911 GT3 R and 911 GT3 RSR. Said to produce 500 hp and 338 lb-ft of torque, the new 991.2 GT3 was developed in Weissach and will be manufactured on the same line as other 911 road cars including Porsche’s one-make series race car, the 911 GT3 Cup. US Pricing: Scheduled to reach dealers in the Fall of 2017, the base MSRP is said to be $143,600 excluding $1050 delivery, processing and handling fee. German Pricing: The 911 GT3 is available to order now. It will be launched in Germany from mid-June. Prices for the new high-performance 911 start at 152,416 euro, including VAT and country-specific equipment. A perfect vehicle for everyday and track use on the weekend and to please everyone, PDK or Manual l love it.